Plans: Manufacturing Leadership Program, W.R. Grace & Co.
[UMBC] has given me the knowledge and critical thinking skills needed to solve any problem. It has taught me to be versatile…and to persevere in the midst of adversity. During his time on UMBC’s men’s soccer team, Travis Dennis has been part three America East Conference Championships and one memorable NCAA College Cup, making it to the Final Four of the NCAA Tournament in December 2014. Dennis credits UMBC with helping him learn how to be versatile, work hard, and persevere through challenges. When not on the soccer field, Dennis has been involved with the American Institute of Chemical Engineers, National Society of Black Engineers, Black Student Union, and Meyerhoff Scholars Program, as an affiliate member. In Summer 2015 he worked for McCormick as a process engineer. He excelled in a part-time position at W.R. Grace & Co. prior to being offered a full-time position at the company, in its Manufacturing Leadership Program, to begin after graduation. 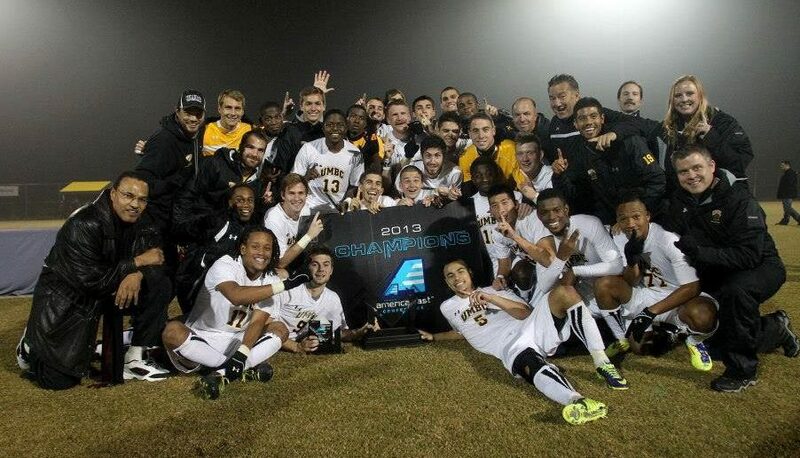 Image: Travis Dennis and his UMBC’s men’s soccer teammates after they won the 2013 America East Championship title, with President Hrabowski; photo courtesy of Travis Dennis. Portrait by Marlayna Demond ‘11 for UMBC.